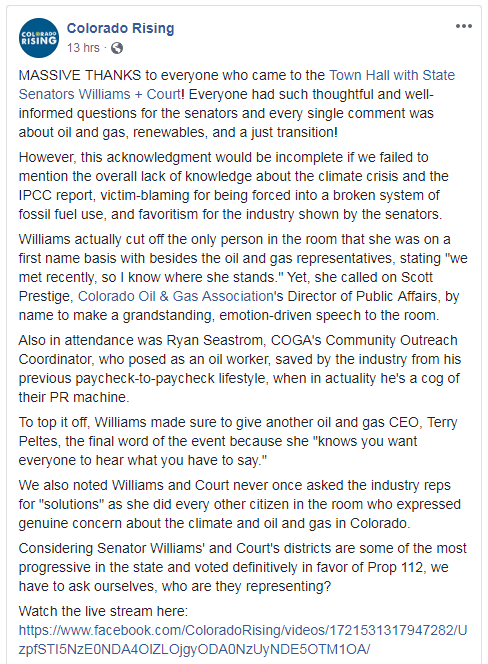 A town hall meeting on climate change held by two Colorado Democratic state senators descended into chaos this weekend before ending with anti-fossil fuel activists unrelentingly shouting down an attendee who attempted to speak on behalf of industry. Senators Angela Williams and Lois Court organized the meeting to inform citizens about various bills pertaining to climate issues under consideration during this legislative session. Both Williams and Court represent districts in and around Northeast Denver. Colorado Rising, the group behind 2018 ballot measure Proposition 112 which would have drastically increased setbacks and put most of Colorado off limits to oil and gas operations, promoted the event on its social media pages and encouraged attendees to “call on Williams and Court to take real action on behalf of our communities and planet.” Dozens of activists showed up to the standing-room-only event with neon signs and called for a halt on permitting. Protesters remained calm as Conservation Colorado gave an overview about global warming and Court and Williams went through the names of several climate-related bills. The trouble started when Court talked about the uncontroversial importance of balance in the legislature and taking into account more than one perspective when making a decision. She then asked the audience how many people drove to attend the meeting. When most of the room raised their hands, she said, “well we’re all guilty.” That’s when the groans and shouting immediately started. Then Court asked how many people in the audience turned on their furnaces in the winter. Court responded that the questions would come later. Court, an educator, compared the room to an unruly group of her students. The tension in the room was then well-established. The senators had to set ground rules for participants to maintain decorum or they would have to shut the meeting down. They mentioned that the point of the meeting was to get feedback about solutions so the legislators could take that information back to the Capitol with them. But heckling continued throughout the “question and answer” session, most of those called-on used their time to accuse the lawmakers of not acting fast enough on climate issues. Representatives of the Sierra Club, Earth Guardians, and 350.org and Food and Water Watch all offered comment. Putting aside the ease with which activists seem to discount the prospect of 23,000 people losing their jobs, the fact is that Colorado’s oil and gas industry actually employs close to a quarter of a million Coloradans—many of whom are highly specialized professionals like geologists and environmental engineers. These people represent 7 percent of Colorado’s workforce, not one. Three participants braved the hostile crowd to offer up positive comments about the industry, how it has become more efficient and has adopted new rules and technologies to reduce emissions, and how it provides good-paying jobs that support the livelihood of thousands of families across the state. Every time the speaker was interrupted with laughing, mocking and shouting about how their industry poisons air, water and “terrorizes” people. In a fitting end, the last commenter, who works in the oil and gas industry and asked to speak about 45 minutes prior, began talking about how important the industry is to everyday life and how we can’t shut it down overnight. He was overpowered with yelling, as the above video shows. Williams had to shout over the noise to declare the meeting over. Despite the disrespectful and unprofessional behavior shown, Colorado Rising seemed pleased with how it went. It’s clear that Colorado’s anti-industry activists have no interest in having a rational discussion. They are only focused on completely shutting down the oil and gas industry in Colorado.